Send a Candy Guy, from the immediate family of $3 million All American Futurity G1 winner Jess Good Candy, and his half-sister, the 'Superior Race Horse,' This Candys Awesome (an earne of $434,265 sired by PYC Paint Your Wagon), is a speedy individual in his own right. — The Fiscal Cliff -QH SI 92 $580,335 AQHA Racing Champion Aged Stallion, Central Hi-Point Aged Stallion, 1st-AQHA Challenge Championship S.-G1,, 1st-Bob Moore Memorial S.-G2,, 1st-Canterbury Championship Challenge S., 1st-Skip Zimmerman Memorial S., etc. — Im A Fancy PYC -QH SI 109 $454,765, Remington Park Oklahoma Bred Futurity [R]-G3, etc. 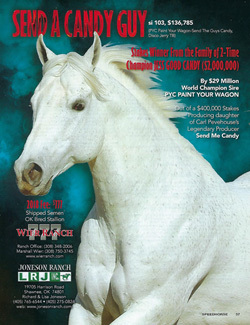 — Mr PYC To You -QH SI 97 $473,686 California Hi-Point Aged Stallion, 1st-Champion of Champions S.-G1, 2nd-Los Alamitos Championship Challenge-G3, 3rd-Z Wayne Griffin Directors Invitational - Div 1, etc. — This Candys Awesome -QH SI 105 to 5, 2016, $434,265 1st-Junos Request S.-G2, 1st-Remington Park Oklahoma Bred Derby-G3, 1st-Decketta S.-G3, 1st-Higheasterjet H.-G3, etc. — Wagon Tales -QH SI 99 $427,579 1st-A Ransom H., 1st-Remington Park Juvenile S., 3rd-All American Futurity-G1, 3rd-Heritage Place Futurity-G11, etc. — Freighttrain B-QH SI 115 $421,761 1st-Black Gold Futurity Championship [R] -G3, 1st-Oklahoma Derby, 1st-Black Gold Derby [R] , 2nd-Black Gold 350 Futurity [R] , etc. — Painted Turnpike-QH SI 115 $385,245 1st-Speedhorse Graham Paint & Apploosa Futurity-G1, 1st-Oklahoma Paint and Appaloosa Futurity (GI)-G1, 1st- Speedhorse Paint and Appaloosa Futurity-G1, 1st-SPEEDHORSE GRAHAM PAINT AND APPALOOSA DERBY (Grade I)-G1, etc. — Joker On Jack-QH SI 106 ($372,980, Refrigerator H.-G1, etc. — Seize the Win-QH SI 107 (to 4, 2016, $368,138 USA, Hialeah Derby, etc. - THIS WAGONS OKAY-QH SI 106 (2011 g. by Pyc Paint Your Wagon-QH). 10 wins, 2 to 5, 2016 in QH races, $173,930, Superior Race Horse (2016), Register of Merit (2014), 1st Altoona Derby, Great Lakes S., Sam's Town S., Ned Goutierrez Memorial S., 2nd Canterbury Park Derby, Finalist in Prairie Meadows Championship Challenge-G2, Bob Moore Memorial S.-G2, Miss Polly Classic S.-G3. (QH SPR=93) Last raced in 2016. SEND A CANDY GUY SI 103 (2010 c. by Pyc Paint Your Wagon-QH). Stakes winner, (Subject Stallion) Last raced in 2015. Dashing for Candy-QH SI 95 (2004 c. by Dashin Chico-QH). Winner at 3 in QH races, $45,937, Register of Merit (2006), Finalist in Speedhorse Gold and Silver Cup Futurity [R]-G1, Oklahoma Horsemen's Association Futurity [R]-G2, Oklahoma Horsemen's Association Derby [R]-G3. (QH SPR=68) Last raced in 2010. - C RAINING-QH SI 88 (2013 c. by Call the Militia-QH). Winner at 2 and 3, 2016 in QH races, 88,543 Pesos ($5,200 USA), in Mexico, Register of Merit (2016), 1st Clasico Jacinto Garduno Futurity Last raced in 2016. - Lc Raining-QH SI 91 (2010 g. by Lavishing Chick-QH). 3 wins at 2 and 3 in QH races, 333,353 Pesos ($24,526 USA), in Mexico, Register of Merit (2012), 3rd Futurity Mexico [R], Finalist in Futurity Criadores Mexicanos [R]-G3 Last raced in 2014. - Paint Candy Flying-QH SI 101 (2010 g. by Pyc Paint Your Wagon-QH). Winner at 2 and 3 in QH races, $56,141, Register of Merit (2012), 2nd O.B. Cockerell H.-G3, Signature S., Orange Blossom S., 3rd OQHRA Fall Classic, Finalist in James Isaac Hobbs S.-G2, Retama Park Derby-G3, Hobbs America Derby-G3. (QH SPR=79) Last raced in 2015. - Fly On Candy Tree-QH SI 93 (2009 f. by Oak Tree Special-QH). 3 wins at 2 and 3 in QH races, $46,107(USA) ($2,312, $43,130(CAN)), Register of Merit (2011), 2nd Princess S. Futurity. (QH SPR=32) Last raced in 2012. SEND THE GALS CANDY SI 105 (1985 g. by Disco Jerry-TB). 6 wins at 2 and 3 in QH races, $291,286, Superior Race Horse (1988), Register of Merit (1987), 1st Sunland Park Fall Futurity-G2, Town Policy H.-G3-ntr, 350 yards in 0:17.290, Los Ninos H., 2nd Peninsula Championship-G1, Foster City H., 3rd All American Futurity-G1, Finalist in All American Derby-G1, Los Alamitos Derby-G1, Kaweah Bar H.-G3. Died 2010. (QH SPR=89) Last raced in 1989. SEND ME THE CANDY SI 93 (2011 f. by One Famous Eagle). 2 wins at 2 in QH races, $187,407, Register of Merit (2013), 1st Hialeah Futurity. (QH SPR=96) Last raced in 2014. SEND ME A CANDY TREE-QH SI 105 (2009 f. by Oak Tree Special-QH). 12 wins in 22 starts, 2 to 5 in QH races, $410,384, Superior Race Horse (2013), Register of Merit (2011), 1st Southwest Juvenile Championship-G, Lubbock S.-G3, Texas Classic Juvenile Invitational [R], 2nd Easy Jet S. [R]-G3, Keokuk S., 3rd Decketta S.-G3, Fair Meadows Belles S., Remington Park Oklahoma Bred Futurity [R], Finalist in Heritage Place Derby-G2, Junos Request S.-G2, Qualified to Speedhorse Derby-G3. (QH SPR=98) Last raced in 2014. - - CANDY CARTEL-QH SI 104 (2008 f. by Corona Cartel-QH). 10 wins, 2 to 5 in QH races, $210,141(USA) ($171,105, $39,190 (CAN)), Superior Race Horse (2012), Register of Merit (2010), 1st Lubbock S.-G3, Decketta S.-G3, Fort Erie Derby, Fair Meadows Belles S., 2nd Sooner State S. [R]-G1, FL Lady Bug S. [R], 3rd Bugs Alive in 75 S. [R], Finalist in Remington Park Inv. Championship-G1, Zia Park Championship-G1, Decketta S-G3. (QH SPR=95) Last raced in 2013. Dam of 4 QH foals, 2 to race, 1 winner, 2 ROM--- incuding: CANDY CARTELS CAT-QH SI 101 (2012 f. by Red Storm Cat-QH). 5 wins, 2 to 4, 2016 in QH races, $162,294, Register of Merit (2014), 1st Decketta S.-G3, 2nd Easy Date Handicap at Remington Park [R], 3rd Remington Park Oklahoma Bred Derby [R]-G3, Finalist in Heritage Place Derby-G2, Dash for Cash Derby-G3. (QH SPR=96) Last raced in 2016. - - JESS SPECIAL CANDY-QH SI 114 (2006 g. by Mr Jess Perry-QH). 6 wins, 2 to 6 in QH races, $155,896, Superior Race Horse (2012), Register of Merit (2008), 1st Indiana Downs Classic S., All American Congress Maturity-ntr, 440 yards in 0:21.090, 2nd Eastex H.-G2, 3rd Prairie Meadows Championship Challenge-G2, Fairmount Park Invitational S., Tom Tucker Memorial S., Finalist in Leo S.-G1, Sooner State S. [R]-G1. Set ntr at Remington Park, 330 yards in 0:16.384 (2011). (QH SPR=85) Last raced in 2012. - - Send Me Candy Paint-QH SI 103 (2008 f. by Pyc Paint Your Wagon-QH). 2 wins at 2 in QH races, $90,246, Register of Merit (2010), 2nd Speedhorse Gold and Silver Cup Futurity [R]-G1, Finalist in Speedhorse Gold and Silver Cup Derby-G3. (QH SPR=83) Last raced in 2011. Dam of 3 QH foals, 2 to race, 2 winners, 2 ROM- including: Paint a Candy Storm-QH SI 105 (2014 f.by Red Storm Cat-QH). Winner at 2, 2016 in QH races, $25,440, Register of Merit (2016), 2nd Bitterroot Juvenile Invitational [R], Fi nalist in Robert Adair Kindergarten Futurity-G3, Qualified to AQHA Juvenile Challenge Championship S.-G2. (QH SPR=79) Last raced in 2017; Goodreasonforcandy-QH SI 93 (2013 g. by Good Reason Sa-QH). Winner at 2, placed at 3, 2016 in QH races, $14,290, Register of Merit (2015), Finalist in Sooner State S. [R]-G1. (QH SPR=58) Last raced in 2016. - - Special Candy Paint-QH SI 109 (2010 f. by Pyc Paint Your Wagon-QH). 2 wins at 2 in QH races, $69,607, Register of Merit (2012), 2nd Speedhorse Futurity-G2. (QH SPR=68) Last raced in 2014. - - Stole the Candy-QH SI 104 (2006 g. by Stoli-QH). 4 wins, 2 to 4 in QH races, $50,470, Register of Merit (2008), 2nd Los Alamitos Championship Challenge-G2, Finalist in Robert L Boniface Los Alamitos Inv. ChampionshipG1, Los Alamitos Championship Challenge-G2, Central Juvenile Challenge-G3. (QH SPR=77) Last raced in 2011. - - Jess a Candy Gal-QH SI 95 (2007 f. by Mr Jess Perry-QH). Winner at 2 and 4 in QH races, $30,819, Register of Merit (2009), 3rd Central Juvenile Challenge-G3. (QH SPR=69) Last raced in 2011. Dam of 4 QH foals, 3 to race, 3 winners, 2 ROM-- including: Candys Little Wagon-QH SI 92 (2013 c. by Pyc Paint Your Wagon-QH). 2 wins at 2, placed at 3, 2016 in QH races, $52,630, Central Hi-Point Three-Year-Old Colt (2016), Register of Merit (2015), Finalist in Black Gold 440 Championship Futurity [R]-G3. (QH SPR=78) Last raced in 2016. - THIS CANDYS ROYAL-QH SI 102 (2003 g. by This Snow Is Royal-QH). 7 wins, 2 to 6 in QH races, $55,046, Register of Merit (2005), 1st Rheudasil H., Finalist in Valley Junction Futurity-G2, Leo S.-G2, East Championship Challenge-G2 twice, Sam Houston Classic-G2. (QH SPR=84) Last raced in 2009. - Eyesa Candy Maker-QH SI 109 (2005 f. by Eyesa Special-QH). 5 wins, 2 to 4 in QH races, $106,494, Register of Merit (2007), 3rd Remington Park Derby-G1, Black Gold Futurity Championship [R]-G3, Finalist in Speedhorse Gold and Silver Cup Futurity [R]-G1. Set ntr at Blue Ribbon Downs, 330 yards in 0:16.568 (2007). (QH SPR=94) Last raced in 2009. Dam of 5 QH foals, 4 to race, 4 winners, 4 ROM--including:. - - EYESA WAGON MAKER-QH SI 104 (2011 g. by Pyc Paint Your Wagon-QH). Winner at 2 and 3 in QH races, $85,322, Register of Merit (2013), 1st Northlands Futurity. (QH SPR=78) Last raced in 2014. - Send the Candy Wagon-QH SI 96 (2008 f. by Pyc Paint Your Wagon-QH). 5 wins at 2 and 4 in QH races, $61,332, Register of Merit (2010), 3rd Oklahoma Horsemen's Association Futurity [R]-G2, Finalist in Valley Junction Futurity-G3. (QH SPR=79) Last raced in 2012. - - I SEE CANDY PAINT-QH SI 111 (2008 g. by Pyc Paint Your Wagon-QH). 9 wins, 2 to 8, 2016 in QH races, $161,305(USA) ($130,688, $30,000(CAN)), Superior Race Horse (2013), Register of Merit (2010), 1st Can Am Nations Cup S.-ntr, 300 yards in 0:15.250, 2nd Speedhorse Gold and Silver Cup Derby-G3, 3rd Texas Classic Derby-G1, Fort Erie Maturity, Finalist in Bob Moore Memorial S.-G2, Two Rivers S.-G3, Miss Polly Classic S.-G3. Set ntr at Will Rogers Downs, 250 yards in 0:13.003 (2011). (QH SPR=77) Last raced in 2016. - - Eyema Special Candy-QH SI 101 (2009 f. by Oak Tree Special-QH). 4 wins at 2 and 3 in QH races, $149,295, Superior Race Horse (2013), Register of Merit (2011), 2nd Valley Junction Futurity-G3, Hialeah Lassie Futurity, 3rd Fl Lady Bug S. [R], Laico Bird S. [R], Finalist in Decketta S-G3, Miss Princess H.-G3. (QH SPR=91) Last raced in 2013. Dam of 3 QH foals. - - This Candy Says Bye-QH SI 107 (2011 f. by Pyc Paint Your Wagon-QH). 2 wins at 2 in QH races, $59,804, Register of Merit (2013), 2nd Fair Meadows Juvenile S., Finalist in Heritage Place Futurity-G1, Speedhorse Futurity-G2. (QH SPR=77) Last raced in 2015. - Eyesa Candy Horse-QH SI 95 (2004 g. by Eyesa Special-QH). 3 wins at 2 and 3 in QH races, $56,554, Register of Merit (2006), 3rd Oklahoma Horsemen's Association Derby [R]-G3, Finalist in Rainbow Quarter Horse Futurity-G1, Speedhorse Gold and Silver Cup Derby [R]-G2. (QH SPR=87). Last raced in 2007. - - JESS GOOD CANDY-QH SI 96 (2013 c. by Good Reason Sa-QH). 8 wins in 8 starts at 2 and 3, 2016 in QH races, $2,014,703, AQHA Racing Champion Two-year-old (2015), AQHA Racing Champion Two-year-old Colt (2015), High Money Earning Horse (2015), Register of Merit (2015), 1st All American Futurity-G1, Ruidoso Derby-G1, Mr Master Bug H. [R]. (QH SPR=99) Last raced in 2016. - - THIS CANDYS AWESOME-QH SI 105 (2011 f. by Pyc Paint Your Wagon-QH). 11 wins in 21 starts, 2 to 5, 2016 in QH races, $434,265, Superior Race Horse (2015), Register of Merit (2013), 1st Junos Request S.-G2, Remington Park Oklahoma Bred Derby [R]-G3, Decketta S.-G3, Higheasterjet H.-G3, Easy Date H. [R], 2nd Balloon City S., Easy Date Handicap at Remington Park [R], Mighty Deck Three S. [R], 3rd Mighty Deck Three S. [R], Finalist in Valley Junction Futurity-G3, Dash for Cash Derby-G3, Decketta S.-G3, Easy Jet S. [R]-G3. Set ntr at Remington Park, 330 yards in 0:16.344 (2014). (QH SPR=97) Last raced in 2016. - - SEND ME THIS WAGON-QH SI 110 (2011 f. by Pyc Paint Your Wagon-QH). 10 wins in 20 starts, 2 to 5, placed at 6, 2017 in QH races, $179,310, Superior Race Horse (2016), Register of Merit (2013), 1st Canterbury Park Derby-ntr, 400 yards in 0:19.583, Canterbury Distaff Bonus Challenge, AQHA Members Plus S., 2nd Charger Bar H.-G1, Prairie Meadows Distaff Challenge, Finalist in AQHA Distaff Challenge Championship-G1, Remington Distaff Challenge-G3. (QH SPR=96) Last raced in 2017. - - HONEYMOON CANDY-QH SI 93 (2012 f. by Pyc Paint Your Wagon-QH). 5 wins, 2 to 4, 2016 in QH races, $84,436, Register of Merit (2014), 1st Prairie Meadows Distaff Challenge, 3rd Remington Distaff Challenge-G3, Canterbury Park Quarter Horse Derby. (QH SPR=93) Last raced in 2016. - - Send Your Candy-QH SI 95 (2011 f. by Pyc Paint Your Wagon-QH). Winner at 2 and 3 in QH races, $30,850, Register of Merit (2013). (QH SPR=70) Last raced in 2015. - - SEND ME GOOD CANDY-QH SI 95 (2013 f. by Good Reason Sa-QH). 3 wins at 2 and 3, 2016 in QH races, $155,629, Register of Merit (2015), 1st Miss Ellen S., 2nd Remington Park Oklahoma Bred Futurity [R]-G2. (QH SPR=97) Last raced in 2016. - Gotta Have the Candy-QH SI 93 (2000 g. by Holland Ease-QH). 7 wins, 2 to 6 in QH races, $44,196, Superior Race Horse (2006), Register of Merit (2002), Finalist in Lazy E Futurity [R]-G2. (QH SPR=61) Last raced in 2006. - Send a Candy Wagon-QH SI 95 (2009 f. by Pyc Paint Your Wagon-QH). Winner at 3 and 4 in QH races, $36,042, Register of Merit (2011). (QH SPR=85) Last raced in 2013. - Paint Your Candy-QH SI 93 (2010 g. by Pyc Paint Your Wagon-QH). 3 wins, 3 to 6, 2016 in QH races, $35,152, Register of Merit (2012). (QH SPR=68) Last raced in 2016. CALL ME CANDY MAN-QH SI 90 (2001 g. by Call Me Together-QH). 4 wins at 2 and . 3 in QH races, $30,901, Register of Merit (2003), 1st Governor's S., 3rd . Mount Pleasant Meadows Budweiser Futurity-G3, Finalist in Canterbury Park . Derby-G3. (QH SPR=60) Last raced in 2005. - IMA CANDY SUSPECT-QH SI 108 (2005 g. by Ausual Suspect-QH). 7 wins at 2 and 3 in QH races, $152,616, Superior Race Horse (2009), Register of Merit (2007), 1st Speedhorse Gold and Silver Cup Derby [R]-G2, 2nd Eastex H.-G2, Blink of an Eye H. twice, Black Gold Futurity [R], 3rd James Isaac Hobbs S.-G2, Finalist in Dash for Cash Derby-G1, Sooner State S. [R]-G1, Refrigerator H.-G1, Oklahoma Horsemen's Association Futurity [R]-G2, Lovington H.-G2. Set ntr at Blue Ribbon Downs, 300 yards in 0:15.256 (2007). (QH SPR=90) Last raced in 2010. - Eyesa Love Candy-QH SI 101 (2006 g. by Eyesa Special-QH). 3 wins at 2 in QH races, $53,285, Register of Merit (2008), 3rd Jack Brooks S. [R], Finalist in Remington Park Derby-G2. (QH SPR=67) Last raced in 2011. - - THIS CANDYS RED HOT-QH SI 99 (2003 c. by Leaving Memories-QH). 8 wins, 2 to 4 in QH races, $251,502, Superior Race Horse (2006), Register of Merit (2005), 1st Speedhorse Gold and Silver Cup Futurity [R]-G1, 3rd Texas Classic Derby-G1, Finalist in Retama Park Futurity-G1, Dash For Cash Futurity-G1, Dash for Cash Derby-G1, Texas Championship Challenge-G1, Refrigerator H.-G1, Remington Park Derby-G2, New Mexico Derby Challenge-G3. (QH SPR=92) Last raced in 2007. - - .FOUND A CANDY TREE-QH SI 96 (2007 f. by Oak Tree Special-QH). 3 wins at 4 in QH races, $72,964(USA) ($37,948, $33,920(CAN)), Register of Merit (2009), 1st Can Am Nations Cup S.-ntr, 300 yards in 0:15.380, Finalist in Juno's Request S.-G2. (QH SPR=80) Last raced in 2012. Dam of 1 QH foal, 1 to race, 1 winner, 1 ROM-- Live to Love Candy-QH SI 84 (2014 c. by Cartels Candy Man-QH) Winner at 2, 2016 in QH races, $20,309, Register of Merit (2016), Finalist in Speedhorse Futurity-G3. (QH SPR=84) Last raced in 2016. - - Pv Eye Desire Candy-QH SI 90 (2014 g. by Desirio-QH). 2 wins at 2, 2016 in QH races, $57,050, Register of Merit (2016), 2nd Heritage Place Juvenile Invitational, Finalist in Southwest Juvenile ChampionshipS.-G1. (QH SPR=94) Last raced in 2016. - - Stone Eyed Candy-QH SI 99 (2006 f. by Sc Chiseled in Stone-QH). 3 wins at 2 and 3 in QH races, $56,972, Register of Merit (2008), 3rd Easy Jet S. [R]-G3, Finalist in Remington Park Futurity-G1, Remington Park Derby-G2. (QH SPR=81) Last raced in 2010. Dam of 1 QH foal. - - Eyema Royal Candy-QH SI 96 (2004 f. by Royal Quick Dash-QH). Winner at 2 and 3 in QH races, $16,389, Register of Merit (2006). (QH SPR=67) Last raced in 2007. Dam of 6 QH foals, 5 to race, 5 winners, 5 ROM-- Eyema Candy Tree-QH SI 102 (2009 f. by Oak Tree Special-QH). 3 wins at 2 and 3 in QH races, $65,620, Register of Merit (2011), 3rd Speedhorse Gold and Silver Cup Futurity-G2, Finalist in Speedhorse Derby-G3. (QH SPR=87) Last raced in 2012. - - Ernies Palace-QH SI 99 (2010 g. by Wave Carver-QH). 3 wins at 2 in QH races, $88,341, Register of Merit (2012), 3rd Oklahoma Futurity-G2, Finalist in Speedhorse Futurity-G2. (QH SPR=69) Last raced in 2015. - Eyesa Candy Man-QH SI 121 (2004 g. by Eyesa Special-QH). 9 wins, 3 to 7 in QH races, $80,994, Superior Race Horse (2011), Register of Merit (2006). Set ntr at Will Rogers Downs, 550 yards in 0:26.487 (2010). (QH SPR=72) Last raced in 2011. - Love My Candy-QH SI 101 (2000 g. by Leaving Memories-QH). 6 wins, 2 to 6 in QH races, $46,474, Register of Merit (2002), Finalist in Heritage Place Derby-G1, Qualified to Altoona Derby-G3. (QH SPR=84) Last raced in 2008. - EYES BLEW BY YOU-QH SI 113 (2008 g. by Mr Eye Opener-QH). 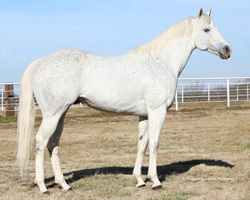 6 wins at 2 and 3 in QH races, $85,500, Texas Hi-Point Three-Year-Old Gelding (2011), Register of Merit (2010), 1st TQHA Sires' Cup Derby [R]-G3-ntr, 400 yards in 0:19.544, Sam Houston Derby Challenge, 3rd Dash for Cash Derby-G2, TQHA Sires' Cup S. [R], Finalist in Sam Houston Championship Challenge-G1. (QH SPR=81) Last raced in 2015. - FAST EYE CANDY-QH SI 113 (2005 g. by Mr Eye Opener-QH). 7 wins, 2 to 6 in QH races, $77,124, Register of Merit (2007), 1st Arapahoe Express S., Pen Pal S., 2nd Altoona Derby-G3, Arapahoe Park Speed Challenge S., Finalist in Mile High Derby-G2. Set ntr at Arapahoe Park, 330 yards in 0:16.280 (2011). (QH SPR=81) Last raced in 2011. - Moe Lassus-QH SI 94 (2013 g. by Favorite Cartel-QH). 2 wins at 3, 2016 in QH races, $19,845, Register of Merit (2016), 3rd South Florida Inv., Finalist in Miss Polly Classic S.-G3. (QH SPR=73) Last raced in 2016. - This Fishers Fast-QH SI 111 (2006 g. by Fishers Dash-QH). 7 wins, 2 to 5 in QH races, $67,689, Register of Merit (2008). Set ntr at Will Rogers Downs, 250 yards in 0:13.078 (2010). (QH SPR=78) Last raced in 2011. - . PAINT A FAMOUS CANDY-QH SI 109 (2008 g. by Pyc Paint Your Wagon-QH). 5 wins at 3 and 4 in QH races, $84,265, Register of Merit (2010), 1st Mighty Deck Three H. [R], 3rd Rocky Heinzig Memorial S., Finalist in Bob Moore Memorial S.-G2, Speedhorse Gold and Silver Cup Derby-G3. Set ntr at Will Rogers Downs, 330 yards in 0:16.517 (2011). (QH SPR=83) Last raced in 2012. - - . Famous Candy Cat-QH SI 103 (2012 f. by Red Storm Cat-QH). Winner at 2 and 3 in QH races, $51,727, Register of Merit (2014), 2nd Black Gold 350 Futurity [R], Finalist in Black Gold Futurity Championship . [R]-G3. (QH SPR=84) Last raced in 2015. - - Chicks Candy Wagon-QH SI 89 (2009 f. by Pyc Paint Your Wagon-QH). 3 wins at 3 and 4 in QH races, $31,712, Register of Merit (2012), Finalist in Sooner State S. [R]-G1. (QH SPR=79) Last raced in 2013. Dam of 1 QH foal. Send Me Candy-QH SI 92 (1979 f. by Tiny's Gay-QH). Stakes placed winner, see . above., see above.